9 days Semi Escorted Tour from Palermo to Syracuse - Departures on SATURDAYS - Small Size - English Only - Limited to max 20 people. Ancient to Baroque. 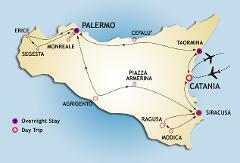 History, culture, cuisine and sunshine in an itinerary around Sicily. 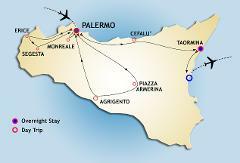 9 days Semi Escorted Tour starting from Palermo - Departures on SUNDAYS - Small Size - English Only - Limited to maximum 20 people. Ancient to Baroque. History, culture, cuisine and sunshine in an itinerary around Sicily. 9 days Semi Escorted Tour starting from Palermo - Departures on MONDAYS - Small Size - English Only - Limited to maximum 20 people. Ancient to Baroque. 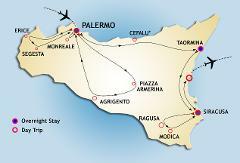 History, culture, cuisine and sunshine in an itinerary around Sicily. 9 days Semi Escorted Tour starting from Palermo - Departures on TUESDAYS - Small Size - English Only - Limited to maximum 20 people. Ancient to Baroque. History, culture, cuisine and sunshine in an itinerary around Sicily. 9 days Semi Escorted Tour starting from Siracusa - Departures on FRIDAYS - Small Size - English Only - Limited to maximum 20 people. Ancient to Baroque. History, culture, cuisine and sunshine in an itinerary around Sicily.